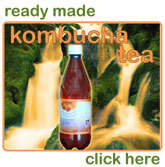 Do I have to have Kombucha tea to make a new batch? However, it may be possible to make a very small brew the size of a cup of tea and add the culture only or a small amount of mother liquid that you may have. Brew this for as long as possible until it is really sour. Then use the brewed 'cup of tea' as your mother liquid and culture for a larger brew. Gradually build up until you have enough to make the size that you need. Always try to keep some saved in a glass jar in the refrigerator.